LITTLETON, Colo. – Spacecraft engineers are in the final stages of readying twin probes to orbit Earth’s moon, on a mission to chart our next-door neighbor’s gravity field in unprecedented detail. The Gravity Recovery and Interior Laboratory (GRAIL) mission by NASA will make use of two spacecraft that fly in tandem orbits around the moon. By working together, the lunar satellites should beam scientists detailed measurements of the moon's gravity field to, in essence, peer deep inside the moon from crust to core to reveal subsurface structures and, indirectly, its thermal history. The two spacecraft have been built and are undergoing final checkout here at Lockheed Martin Space Systems. Once GRAIL is off and trekking toward the moon (launch is set for this September), spacecraft flight operations will be conducted from this facility. The GRAIL moon mission is part of NASA’s Discovery program, an effort to develop focused space exploration missions at lower costs. NASA's planet-hunting Kepler space telescope, ion-powered Dawn mission headed to two asteroids, and Stardust-NeXT mission bound for its second comet are some of the agency's Discovery missions. But unlike those missions, GRAIL has its sights set on Earth's nearest natural neighbor. Lockheed Martin space engineers with NASA’s Gravity Recovery and Interior Laboratory (GRAIL A) spacecraft, scheduled for launch this year. “The overall mission from launch to end of science collection is just under nine months,” said Stuart Spath, chief engineer for GRAIL at Lockheed Martin Space Systems. The actual science phase of the mission takes a little less than 90 days to complete once the probes are in orbit around the moon. But that part will take some time. After liftoff and separation of the GRAIL twosome, the road to the moon will take roughly 3 1/2 months. "We’re taking the long route," Spath told SPACE.com. "You can get to the moon much quicker than we do … and the reason is twofold." By initially cruising, and through the sun-Earth Lagrange Point 1 (a gravitationally stable point in space between the Earth and sun), there's a spacecraft fuel savings, and technicians can thoroughly check out the two probes prior to their respective swings into lunar orbit, Spath explained. One of the spacecraft, GRAIL A, should get to the moon a day before GRAIL B. After shaving down their respective orbits, the pair will skirt over the lunar surface at around 30 miles (50 kilometers) altitude, Spath noted. In doubling up on the moon, the spacecraft will fly one behind the other, circling the heavily cratered world for several months. The spacecraft will be anywhere from some 40 miles (60 km) to approximately 137 miles (220 km) apart. Each probe uses onboard microwave ranging instruments to send signals between one another, and then relays data back to Earth to be examined by scientists. Spath said that by looking for "little bobbles" in their orbit – differences in distance the signals traveled between spacecraft, orbit after orbit – what can be discerned are gravitational changes over the entire moon. That information is always being calculated and stored for later transmission to Earth when the spacecraft are not in relay range of Earth, Spath pointed out. If all that sounds like on-the-fly precision, you’re right on the beam. Man with a mission…to the moon. Stuart Spath, chief engineer for NASA’s Gravity Recovery and Interior Laboratory (GRAIL) at Lockheed Martin Space Systems, holds small models of the GRAIL twosome. Attaining ultra-exactitude meant designing the GRAIL duo to be rock-steady. Thermal distortion of the spacecraft structure had to be curbed, despite the wild temperature swings of heat and cold while orbiting the moon. Also, body-fixed solar panels can’t flex and bow going through thermal cycles. Basically, any creaking and groaning of the two craft, each the size of a washing machine, could impact the quality of the science measurements. "They are as rigid and as solid as we can make them," Spath pointed out. The GRAIL spacecraft draws upon three high-tech, flight-proven missions. One is the XSS-11 spacecraft developed by Lockheed Martin for the U.S. Air Force Research Laboratory. The GRAIL propulsion technology is heavily leveraged from that spacecraft, Spath said: a warm gas system that burps out very small and precise engine pulses. "In our 90 days of science mission, we only use 200 grams of fuel," he added. GRAIL is also the lunar counterpart of the NASA/JPL-German Gravity Recovery and Climate Experiment, or GRACE — twin satellites that launched in 2002 to make detailed measurements of Earth’s gravity field. Lockheed Martin's avionics expertise in building the Mars Reconnaissance Orbiter found its way into the GRAIL mission, too. "We hope we’re borrowing the best of all three missions and marrying them together," Spath said. The key was relying on a heritage of reliable components, but not doubling up on everything for GRAIL. That design philosophy, Spath explained, may be a pathfinder for short missions, perhaps for Earth-oriented satellites that seek focused and rapid science collection for targeted global climate change measurements. 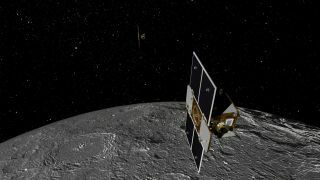 The upcoming mission also includes the GRAIL "MoonKAM" – short for "Moon Knowledge Acquired by Middle" school students. GRAIL MoonKAM is hosted by Sally Ride Science of San Diego – a science education company founded by America’s first woman in space. As the mission gets under way, students can request that photos of specific areas of the lunar surface be taken by special cameras on the satellites. These images will be posted on the Internet, and students can refer to them as they study various features of the moon’s topography. At end of mission, the plan now is for each GRAIL to spiral into the moon. One idea is for the MoonKAM gear on one probe to image its sister ship augering into the lunar landscape before it, too, meets its fate. "Our goal is to get the science mission done … and the decommission of GRAIL is a little bit vague at this time," Spath concluded.